My son, Clay, called me out of the clear blue a few years back and asked me if I would like to go with him to Africa to hunt plains game. My immediate thought was it would be too expensive. Clay had looked into the costs and told me that he thought that we could hunt 4 or 5 different game animals in Africa for the same cost that a trophy elk hunt would cost in the United States. I was skeptical, but went on-line and was surprised to find that plains game hunts were relatively inexpensive when compared with hunts in the Americas. I told him that I was interested and together we begin to do the necessary research. In May of 2008, after a year of preparation, we began our first adventure in Africa. I loved the experience and knew as soon as I got off the plane at home that I was going back. I had the bug and there was no cure. Africa is like eating potato chips … you can’t stop with just one. After the dust settled, I asked Clay if he wanted to go back. He really wanted too, but had commitments at home. I did not want to go back to Africa alone. I searched for partners, but with the economy in the states in shambles, I was not able to find any friends willing to commit to the trip. When I talked to my wife about it I got what you might expect …. you’ve been once already, we don’t have any room in the house for more trophies, you promised me a vacation of choice after your last hunt, etc. etc. My answer was to ask her to go back with me. I got the look of Medusa … snakes and all. I turned my eyes away so I would not turn to stone. Deep down I knew that if I got her there, she’d love it. But getting her there was going to be the biggest challenge of my life. Denise is a home body, head strong and stubborn beyond words. Pulling this off was going to be akin to the unstoppable force hitting an unmovable wall. I asked God for strength and started to ponder my approach. I had become obsessed with Africa. My biggest mistake was that I had run it into the ground before I left on my first trip. I spent a year reading, shopping, packing, repacking and talking about the trip after I got home. I talked about it nonstop and had driven her crazy with it. Denise just wanted it to go away. So I gave it a rest and a week later asked her again about going with me on another trip back to Africa. She gave me the same glare and said in a half growl … absolutely not. As we say in the south … Shucky Darn!!! In my mind, this was not the end of the story. I just needed to man up and endeavor to persevere. Step one – Plan a trip Denise could enjoy. 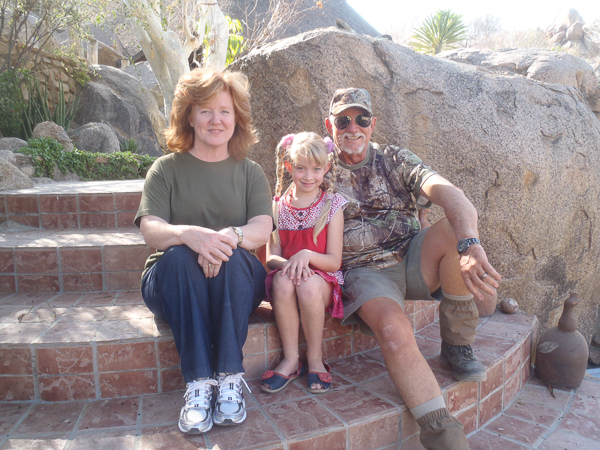 My first step was to design a trip that combined my hunting with a family vacation in a safe part of Africa. I needed to make the trip enjoyable for Denise if this was going to work. To help plan the trip, I purchased a copy of the African Hunting Directory (AHD). The AHD is a comprehensive guide that provides information on where to hunt and who to use on your hunt. It also provides a complete list of things to do to prepare for the trip. Since I was very happy with Namibia and viewed it as a safe place to visit, I focused on reviewing each of the Namibia Professional Hunting Association Members listed in the AHD for that Country. During this review I focused on outfitters who catered to families and offered tourist activities. From this screening I selected three outfitters. I contacted each of these and obtained a complete list of references. I spent a week calling the listed clients. After these conversations I selected Shona Hunting Adventures for a combination safari/vacation. The owner of Shona (Johann Veldsman) was in the field at the time and I was asked to work with their Hunting Consultant and Booking Coordinator, Rick Wilks of Wilks’ Safari Adventures. I explained my situation to Rick and he helped me arrange a trip agenda that mixed hunting with a number of interesting side trips that we thought Denise would enjoy. He also assured me that the staff at Shona would keep Denise happy and busy while I was hunting. Of the activities available we selected a visit to a Himba Village, the Ancient Rock Carvings on Peet Albert’s Koppie, a Cheetah farm that rehabilitates injured Cheetahs’ and the Etosha National Park. We also carved off time at the end of the hunt to shop for gifts in Nambia’s capital city of Windhoek. With the agenda established, Rick put together a trip package that included all the information I needed to show Denise including a nice video. I sat down with Denise and went over the package and she told me that she like the idea of a joint hunting/vacation package. Step 2 – Fix the germ thing. Denise had previously worked at a hospital and had an acute fear of disease. Knowing this, I arranged to have her talk with a doctor at the Infectious Disease Center in nearby Huntsville, Alabama. He looked at our planned destination and discussed the health issues that might be present there. He assured her and recommended shots and pills to protect her from sickness. He also offered advice on things to do to avoid health problems. This did the trick. Step 3 – Fix the food issues. I really have never understood the food issues that Denise has. She loves vegetables and southern garden foods like kale, mustard, collards, turnip greens, cabbage, etc. Basically she is a grazer. She also has an aversion to spots in her food and examines her plate closely to see if there are any specks that have a color that contrasts with the food items. I know … its crazy, but she will move every color particle in her plate to the side before eating. She also does not eat game food. To overcome this issue and prevent her from starving on the trip, I discussed the issue with the PH who assured me that he would serve her only spotless fodder. I also told Denise that I was OK with her taking her own food on the trip, even if it took us over our airline weight limit. Step 4 – Work the funding issue. My last hurdle was funding. Denise was concerned that the trip would break the bank. To overcome this obstacle I built a Microsoft Excel spread sheet in my computer and did an honest assessment of all of the costs. This included air fare, and the fees needed by the outfitter, shipping company, broker and taxidermist. I also include funds needed for tips, side trips and lots of money for shopping. I then opened a savings account and pigeon holed all the funds that I needed. I promised that we would not book the trip until we had all the funds required, including money to pay our bills in advance before leaving on our trip. After doing this, I was forced to postpone my trip a year. Shocky Darn again!!!!! Even after all of my hard work, Denise started to back peddle as the trip neared, but I managed to get her on the plane. After the plane door closed there was no turning back. Now I needed to help her enjoy the trip. This seemed easy until we got to Frankfurt Germany to find out that our flight to Namibia was delayed a day due to engine problems. I thought this would be no problem. All I had to do was get a motel near the airport and we would get some rest. It seemed easy enough … but it was not to be. Frankfurt was holding a huge automotive show and every motel in town was fully booked. Hucky Poo!!!! (A step from Shocky Darn) I called Gracy Travel International, Inc (our booking agent) and explained the problem. They told me to hold tight and they would take care of things. An hour later they called and had me a room in town at pre-event prices. OK … life’s good. The next day we took a cab back to the airport and got in line at the Air Namiba ticket counter. There I was informed that the engine problem had turned into an engine change-out and that we were going to be bused two hours north of Frankfort and put up in a 5 star hotel with all expenses paid until the plane was ready. This became a mini-vacation and allowed us to see some of Germany. The next day we got on a fully functional airplane and flew to Windhoek Namibia where we were greeted by our PH (Johann Veldmans) and his adorable six year old daughter, Zoe. traveled to the main lodge. Denise thought that she had died and gone to heaven. We had a private Chalet overlooking a water hole. I’d leave early to hunt and she would sleep in. The staff brought her coffee and sweets to get her started. When she was ready she would walk to the main lodge to socialize and participate in craft activities. She hit it off with the camp staff and enjoyed swapping recipes. If she got bored, the staff would take her on game drives to photograph the wildlife. We came home with 1700 pictures. One evening we drove to an overlook and watched the sun set while drinking sundowners. It was very relaxing and it felt like being on a second honeymoon. Mixed in with hunting, we traveled to tourist sites and had a grand time. I took more game than I wanted and Denise had a wonderful time. below and take her with you. It worked for me. Book the trip with a good hunting consultant and travel agent. Provide your spouse with the tools needed give her a better picture of your destination. Have a doctor discuss disease prevention. Include your spouse in the building of a cost estimate including money for shopping. Buy travel insurance to cover in-flight delays. Stay at an upscale lodge. Mix hunting with other activities that your spouse will enjoy. Let your PH know about any of your spouse ’s concerns in advance of the trip. Don’t push the trip on her. Don’t exclude her from the planning. Don’t make her feel like she needs to hunt if it’s not her thing. Hide the blood and guts. If you do this right, your spouse will be bugging you to go Africa.